It is that time again! Link up an old post or new with any finds, secrets, thrifted goods, or just an awesome project you are working on that just may save someone some time and money! No rules just have fun and check out the other innovative ways everyone is saving some money! Hey!! You won my giveaway!! Yahoo!!!! HEY! I clicked over to you from the color brigade! 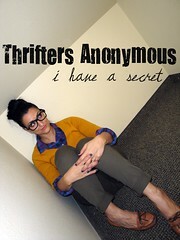 I love your blog and this link up because I thrift ALL THE TIME! Look forward to becoming new blogging buddies!